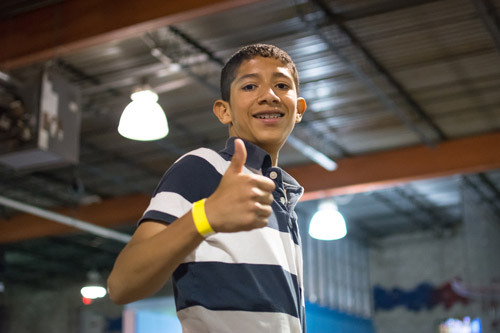 Teens Club offers evening and weekend extracurricular opportunities for middle school students (6th–8th grades), providing social and developmental support through group classes, experience and exposure field trips, and service learning projects. Through active learning opportunities with peers, students are given the opportunity to engage with the world surrounding them and try new interests and activities. All enrolled middle school students are eligible to participate in our after school tutoring support opportunities, weekly Bible study and mentoring programs. At times building new relationships can take a lot of courage. Especially when a leader chooses to be vulnerable and share personal stories with middle school students who have had a rough day. This has been the case for Mr. Kalin, who has been in this scenario each week since coming on staff in September. He is an assistant Teens Club director in Casa’s Local Leaders program. This fall Casa Chirilagua expanded and relaunched our middle school program, Casa Club. Not only did we revamp the program, but I made my first appearance with Casa as the Youth Programs Coordinator. With a new program, new participants and myself being the new coordinator, I had no idea what to expect. Casa Chirilagua staff strongly emphasize creating a safe place for youth to work on academics while building positive supportive community. However I wondered whether the teens would buy into this message or not. Would Casa Club consist of students attending because their parents told them to? Or could it be something more? During March, Teens Club had the opportunity to celebrate spring by building kites. Our students walked into Teens Club to find print outs of kite building directions, stacks of dowel rods, garbage bags, rolls of Caution/Cuidado tape, and string. Many were hesitant to get on board. Slowly, with prodding from some of their more enthusiastic peers, almost all our kids got on board.